Muhammad Ahmed Qanitah was a member of the al Qaeda-linked Tawhid and Jihad Group in Jerusalem, and previously served in Hamas’ Izz ad-Din al-Qassam Brigades. A leading media official from Tawhid and Jihad Group in Jerusalem has praised his fellow Salafi jihadists in Gaza for their recent fighting against Israel. In addition, he has called for unity between the groups. In a statement released on jihadist forums, the Islamic State of Iraq has offered its condolences for the recent deaths of Abu al Walid al Maqdisi and Ashraf al Sabah in the Gaza Strip. 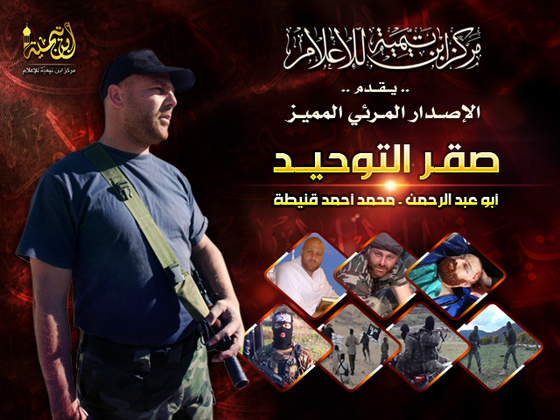 Masada al Mujahideen has threatened to carry out attacks against Israel and Hamas in response to the assassination of Abu al Walid al Maqdisi, the former emir of the Tawhid and Jihad Group in Jerusalem. Salafi sources have confirmed that the Mujahideen Shura Council is a consolidation of Salafi-Jihadist groups in Gaza, and that Abu al Walid al Maqdisi was one of its leaders. Ashraf al Sabah, the emir of Ansar al Sunnah, was also killed in yesterday’s airstrike. On Saturday, the Israeli Air Force killed Abu al Walid al Maqdisi, the former emir of the Tawhid and Jihad Group in Jerusalem. Al Maqdisi’s death may provide evidence of the consolidation of Salafi-Jihadist groups in Gaza into the Mujahideen Shura Council. Abu al Walid al Maqdisi, the leader of the Tawhid and Jihad Group in Jerusalem, was freed after more than a year in prison. His release was announced by Masada al Mujahideen, one of six major jihadist groups operating in Gaza.